As with any purchasing decision, it is critical to first decide on a budget for your investment. In fact, there is simply no need to spend more than $50 on a high quality blood pressure monitor. If you are looking for the most cost-effective device, I have 2 well-researched, under-$50 recommendations for you here. 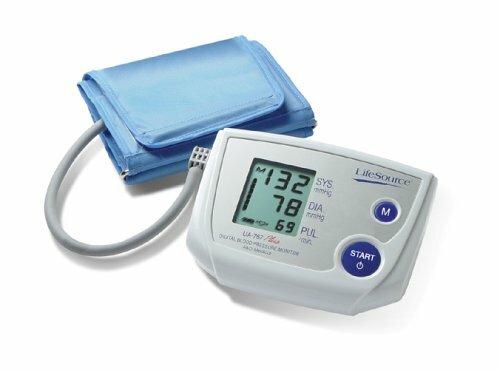 The LifeSource UA-767, also known as the LifeSource Advanced One Step Auto Inflate Blood Pressure Monitor, is part of the line of personal blood pressure machines produced by A&D Medical, which also manufactures many medical products utilized by doctors in hospitals and ambulances. This review will give you a detailed breakdown of the UA-767 so that you can decide if it is the right device for your health needs. This monitor is perfect for users seeking an easy-to-use device that is also both accurate and affordable. It even comes with a lifetime warranty, which is not common in today’s market. The simplicity of this machine makes it a great option for first-time buyers. If you want to track your health on a daily basis without dealing with overly complicated or extraneous features, this monitor provides the bare essentials necessary to effectively manage hypertension. There is no need to worry about pressing the wrong button because there is only one button to operate this monitor. Simply press the Start button to power on the monitor, properly apply the arm cuff, then press the Start button once more to take a measurement. The process for taking a blood pressure reading couldn’t be any simpler than putting on the cuff and pressing one button! The UA-767 has been clinically tested and validated for accuracy, enabling users to obtain professional quality results from home. It has been approved by authoritative groups such as the American National Standards Institute (ANSI) and the European Society of Hypertension. The auto-inflate cuff automatically inflates to the correct pressure for each measurement to deliver consistently accurate. It is crucial to select the correct cuff size in order to obtain accurate readings. Wearing too small of a cuff tends to yield a higher than expected reading whereas too large of a cuff results in a lower reading than expected. The LifeSource UA-767 comes with cuffs targeted to fit small and medium arms. Choose from 2 different versions of the same monitor sold with cuffs targeted for small or medium as required. You can purchase extra cuffs, including the large size separately. The large LCD display and buttons on this monitor are easily legible for all ages. The screen is very easy to read and only shows you the 3 numbers that matter the most (systolic blood pressure, diastolic blood pressure, and pulse rate) without unnecessary symbols cluttering the display. The newer version of the UA-767, known as the UA-767F and shown below, also displays and records the date and time concurrently with the health measurements. I am a big fan of the simple display and believe LifeSource does a great job only showing you what you need to know without providing extraneous information. Note that the UA-767F includes a customizable AccuFit Plus Cuff, which fits sizes (8.6-16.5 inches). For other sizes, cuffs can be purchased separately. The UA-767F comes standard with an Irregular Heartbeat Detector, which is an invaluable feature usually only available for more expensive monitors. During each BP reading, the device checks for irregular heartbeats and clearly displays a symbol on the LCD screen if it detects an irregular heartbeat. The meter also adjusts the measurements when irregular heartbeats are detected in order to provide accurate blood pressure and pulse rate readings. Unlike many blood pressure meters that only come with a 1-year or 5-year warranty, this monitor and the accompanying cuff are fully-backed by a lifetime warranty. The lifetime warranty is a great aspect of purchasing this machine and offers you as the buyer peace of mind knowing that if something breaks, no additional out-of-pocket expenses are incurred. Rather, just contact the customer support team and they will assist you in getting the product working again. 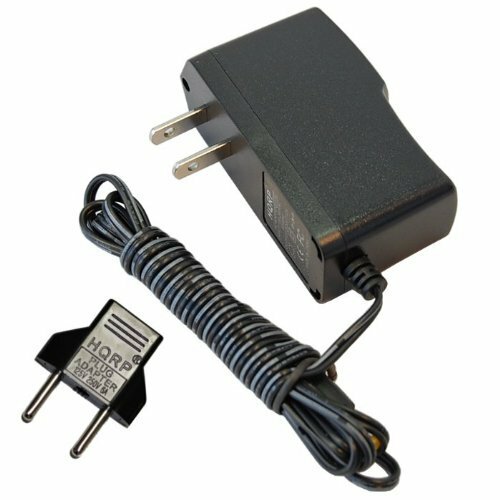 Batteries and AC Adapter – The UA-767F device can be powered using batteries or with an AC Power Adapter (sold separately). If you are wanting to travel with the monitor, then powering the machine with rechargeable batteries would be the more convenient option. However, the one-time expense of purchasing the AC Adapter will save you from having to buy replacement batteries for the life of the monitor (it is backed by a lifetime warranty, after all). This AC Power Adapter even comes with a European outlet adapter, which will be useful when traveling internationally. If you do choose to use batteries, current users of this machine report that the batteries will last for a long time even with using the monitor on a daily basis. Both the LifeSource UA-767 and the LifeSource UA-767F blood pressure monitors provide a simplistic approach to taking care of your health. These devices are very budget-friendly and also very accurate. They have a decent memory capacity for the cost, although I wish batteries or an AC adapter were included. One of these monitors would certainly be a good choice for your very first home monitoring unit. Take your pick from the table above and get on your way to better health! If you are in need of an affordable yet portable blood pressure monitor, then put the Omron BP652 7 Series Wrist Blood Pressure Monitor on your radar. This automatic Omron wrist blood pressure monitor is highly rated on Amazon with over 8,700 reviews. The Omron BP652 7 Series is a cost-effective option which combines the accuracy and advanced features usually only available in larger upper arm models for a reasonable price tag. This wrist meter is easy to use and especially great for those that find upper arm monitors to be cumbersome or painful to use. What sets the Omron BP652 7 Series Wrist Blood Pressure Monitor apart from the inaccurate wrist meters of the past is the use of Omron’s Heart Guide Technology. Wrist blood pressure meters have had a bad reputation for poor accuracy, which is usually attributed to not using the monitor according to instructions from the user’s manual. Of course, you would never know if you were in fact using the monitor correctly either. Well, that is no longer the case for the Omron 7 Series and the included Heart Guide Technology. What the Heart Guide Technology does is clearly indicate to you, via the Heart Guide Indicator light at the top of the monitor and a useful buzzer, whether or not you are in the optimal position for taking a reading. The optimal position for a wrist monitor involves holding your arm across your chest (Pledge of Allegiance style) at heart level while firmly holding your elbow steady with your free hand to avoid extraneous body movement. The 3 possible settings you can use with Heart Guide Technology for the Omron BP652: ON1, ON2, and OFF, are explained below. ON1 – Not Recommended – is the default setting, which is surprising because it does use the Heart Guide Technology feature, but not to its full capability. With ON1, the monitor automatically takes a reading after several seconds regardless of whether or not the monitor is correctly positioned. The Heart Guide Indicator light will turn blue if you are in the right position or orange if you are not in the correct position. With ON1, if the light is blue for more than 2 seconds (indicating you are in the optimal position), the cuff will automatically inflate and take a measurement. This portion of the ON1 feature makes sense. However, if you are in an incorrect position for more than 5 seconds, as indicated by the orange light, the monitor will still take your reading. This part is what is confusing and counter-intuitive about the ON1 setting. I don’t understand why the default ON1 will override the Heart Guide Technology and still take a reading if you are not in the correct position, which is why we recommend using the ON2 setting instead. I am not sure why ON2 is not the default setting for this monitor. When initially configuring your monitor, you will want to set it to “ON2” mode to take full advantage of the Heart Guide Technology. With ON2, the monitor will beep twice if it detects that the monitor is too far away from the optimal position, and beep once signifying you are in the proper position and ready to take an accurate reading. Additionally, the orange Heart Guide Indicator light at the top of the apparatus will turn blue once the Omron BP652 has detected you are in the optimal position. So if you keep seeing an orange light, simply reposition your wrist until the light turns blue. After seeing a blue light for more than 2 seconds, the cuff automatically inflates and takes an accurate measurement since you are in the best position for obtaining a blood pressure reading. OFF Setting – only for advanced users. This setting turns off the Heart Guide Indicator completely and will allow you to take a reading even if you are not correctly positioned. Since the Heart Guide Technology is a driving factor for purchasing this monitor over other models, I recommend using the ON2 setting as described above to take full advantage of this nifty feature. However, the OFF setting could be useful once you become a pro at using your Omron BP652 7 Series Wrist Monitor and can place your body in the correct position via muscle memory and no longer have a need for any additional indicators to tell you if you are in the optimal position. In addition to the handy Heart Guide Technology, there are a few other features this monitor provides that you should know about. The first is the Irregular Heartbeat Symbol, which is displayed on the right side of the screen near the top, and is shown when there are multiple instances of irregular heartbeats detected by the monitor during measurement. Irregular heartbeats are not to be taken lightly, and you should contact your doctor if you continuously see this icon. The Movement Error Symbol is displayed when excessive body movements are detected during a reading, letting you know that you should remove the cuff and take another reading after waiting a few minutes. On the left side of the display, the vertical BP Level Indicator bar gives you a quick visual of how your BP level corresponds to the international guidelines for the upper limit of normal blood pressure of 135/85. It is important to track your blood pressure over time and to not rely on a single reading. These two concepts work seamlessly with the Omron 7 Series Wrist Monitor. You can take your blood pressure up to 3 times in any 10 minute period, and the average of the 3 readings is stored on the machine. No need to bust out your calculator, just take 3 readings and the monitor will do the calculations for you! The monitor stores the most recent 100 measurement values (blood pressure & pulse rate) for 2 separate users. This means that if you and your partner each take one reading in the morning and one in the evening, as recommended, you will each have almost 2 months worth of morning and evening readings to share with your doctor. This type of extensive data can be invaluable and provide your physician with helpful insight to best address your current health needs. For example, what if you just started taking a new medication one month ago and you have started to feel a little different than usual? Well, you will have 100 recent readings to tell you whether or not the new medication is affecting your blood pressure and/or pulse and can alert your doctor to see what adjustments need to be made to your dosage to best protect and improve your health. In addition to providing a large memory capacity for 2 users simultaneously, there is also a Guest Mode which takes a single reading and does not store the results. 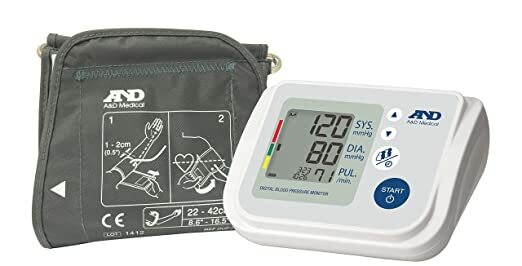 This can be useful if you have a friend looking for a blood pressure monitor and you want to let them try yours out without them affecting your averages! This monitor is the ultimate blood pressure monitor for travelers and anyone else who finds themselves away from home on a regular basis. Portability is a key aspect of selecting a wrist monitor over (or in addition to) a conventional upper arm blood pressure meter. In case you don’t believe that transportability is a quintessential feature of this wrist monitor, Omron even includes a storage case with the monitor. The wrist cuff is the standard size of 5.25 – 8.5 inches in circumference, which fits the majority of the population. Be sure to measure your wrist to make sure the monitor will fit you as well. 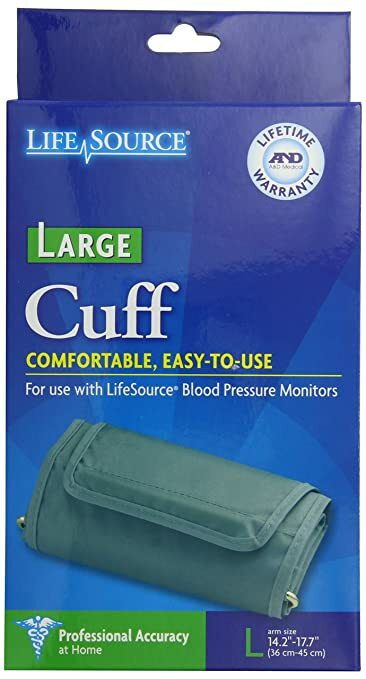 Users find this cuff much more comfortable and much less painful than the cuffs of upper arm monitors which tend to squeeze your upper arm in a less than desirable manner. 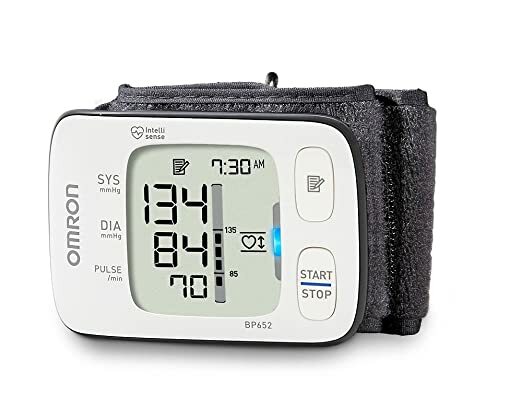 The Omron BP652’s LCD digital display, which is unfortunately not backlit, contains large numbers to clearly indicate your systolic and diastolic blood pressure and pulse rate. Also, there is adequate space for the many indicator icons previously mentioned to fit on the screen. The noise level of this wrist monitor is much less than a conventional upper arm monitor due to its smaller size. This makes the Omron 7 Series a great choice for those seeking to take measurements discreetly, whether in public or even at the workplace. The monitor itself (excluding cuff and batteries) has a warranty of 5 years to allow you plenty of worry-free travel time with your monitor without thinking about needing a replacement. I’m not sure why Omron decided to exclude the wrist cuff from the 5 year warranty though. The Omron BP652 scores a 4.3/5 with over 10,000 customer reviews. This excellent rating can be contributed to the wonderful value and the helpful, advanced features this monitor provides. Some users claim this model is inaccurate, but many more believe the readings are in line with the measurements taken by their doctor. The most common source of inaccuracies is not using this monitor as directed and can be overcome by utilizing the helpful Heart Guide Technology with the recommended ON2 setting as stated above. 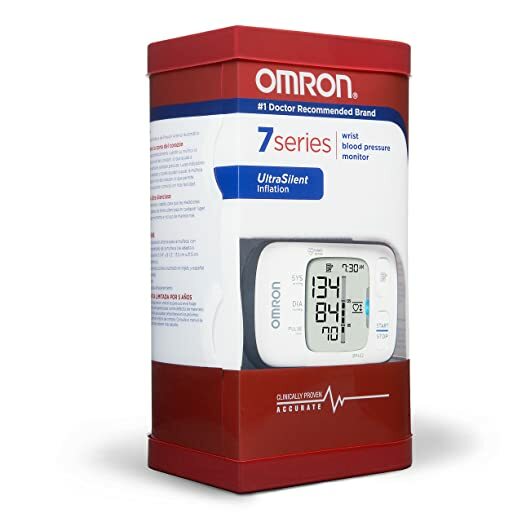 With a price tag under $50, the technologically advanced Omron BP652 7 Series Wrist Blood Pressure Monitor offers you great features and accuracy without busting your budget. This model is a perfect fit for travelers and for those looking for an accurate blood pressure meter that is less bulky than an upper arm monitor.